Brighton. Brighton's Annual parade as one of the most exciting events during the Pride. Over 160,000 visitors will have a spectacle this weekends, with Rainbow colours n glitter and more glitter . At the Main Park , a quite simple most spectacular diverse and flamboyant Festival . 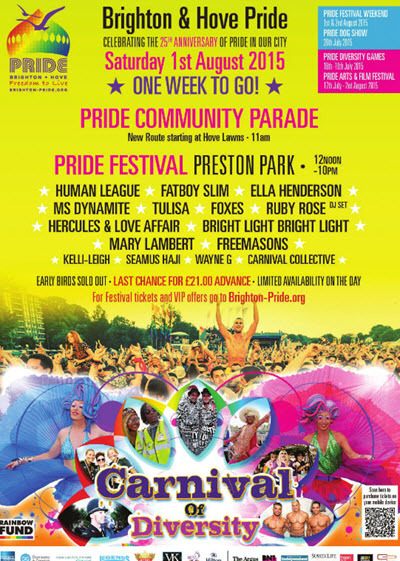 This years 25th Anniversary Pride Festival in Prestopn Park will see Fatboy Slim, Ella Henderson, The Human League, Foxes ,Tulisa, Kelli-Leigh under music leader DJ Wayne G and many more . And we don't forget the visit of famous lady :Ruby Rose. 2015 will see the UK's biggest Pride festival mark 25 fantastic years of Pride in the City. and is widely anticipated to be the biggest Pride celebration in the City to date. 2015 Carnival of Diversity encompasses everything that has become iconic about the diverse, creative and open-minded community that makes Brighton internationally famous. The community parade is the spectacle of the year and a chance for you to join with others in what is the liveliest, most colourful, uplifting and empowering visual showcase in the city. On Brighton's favourite local (gay)bars , venues and businesses will once again be supporting the Pride Village Party and Rainbow Fund. The 25th Years Pride Celebration will be one of the biggest to date.